What is next at the West Valley Nuclear Waste Site? The comment period on the DOE draft Supplemental Environmental Impact Statement and State Environmental Quality Review on the final cleanup of the West Valley site ended May 25, 2018. The Department of Energy (DOE) and NY State Energy Research and Development Authority have hired Cohen and Associates to prepare the final environmental impact statement (and SEQRA). The next step will be a draft Environmental Impact Statement for public comment and public meetings in about a year. In the meantime, Neptune and Company have been contracted by DOE and NYSERDA to carry out a Probabilistic Performance Assessment. The public is calling for an electronic searchable library with all inputs and assumptions accessible to the public during this process and the EIS. The public is also calling for real time monitoring of the air offsite and at distance from the site before during and after the demolition of the massive highly contaminated Main Plant Process Building MPPB which was used to reprocess irradiated nuclear fuel from 1966 to 1972 and for some of the solidification and storage of the waste after. Many comments were made orally at the 3 public hearings and in writing by the May 25th 2018 comment deadline. Some of those comments are posted here from organizations and individuals. Citizens’ Environmental Coalition Comments on Task 1.3 Technical Memorandum- Selective Removal Scenarios Revision 1 April 2017, West Valley Exhumation Working Group & Enviro Compliance Solutions, Inc. Historical footage on West Valley has been compiled and posted on YouTube by two of the Buffalo TV stations that covered the issue back from the 1970s to the 1980s. Includes some Department of Energy of Atomic Energy Commission footage of reprocessing at the site. Site opened in the 1960s and closed in 1970s. West Valley Nuclear Fuel Services promotional video early 1960s describes and shows the reprocessing steps including transportation. 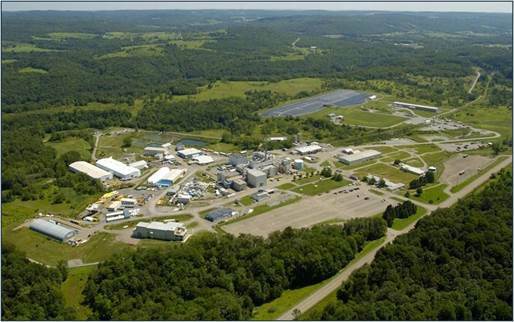 West Valley, NY has a complex radioactive waste site with long-lasting nuclear waste mainly from atomic weapons and power production and some other generators. The site has high-level, so-called “low-level,” transuranic and mixed (radioactive and hazardous) nuclear wastes buried, stored and leaking. Radioactive buildings carried out reprocessing and solidification of high level liquid waste. They are being removed without real-time offsite air monitoring and the highly radioactive below-ground portions remain. Commercial burial of radioactive waste in a dozen 20-30 foot deep trenches began in the early 1960s and continued until 1974 when water filled up the trenches, burst through the trench caps and flowed into surrounding streams that run into Cattaraugus Creek, through Zoar Valley and the Reservation of the Seneca Nation of Indians, into Lake Erie, upstream of the water intake for Buffalo and other major populations in the US and Canada. From 1966- 1972, irradiated nuclear fuel from both atomic weapons and commercial power reactors was brought in and reprocessed (to extract uranium remaining in and plutonium formed in the fuel rods), resulting in high worker exposures, many fires and high levels of radioactive contamination released into the streams that drain the site and gush into the Great Lakes. Reprocessing wastes were also buried at the site including 42 irradiated fuel assemblies (high level weapons waste) from the Hanford N reactor. Plans Nuclear Fuel Services (then a subsidiary of Getty Oil Company) to resume reprocessing, after the closure for improvements in 1972, were cancelled when earthquake dangers were identified and improvements were projected to cost too much. Shortly thereafter the US decided to stop all reprocessing of commercial nuclear fuel because of the nuclear weapons proliferation danger. Geologically, the site is in a bedrock valley that is expected to erode into the Great Lakes in centuries to come, but the nuclear waste buried at the site will remain dangerously radioactive much longer than the projected erosion rate. In 2008 an independent Full Cost Accounting Study of the read costs of cleaning up nuclear waste at West Valley was completed concluding that it could cost much more the longer we wait to exhume the site. Even if only a small portion of the radioactivity that is at the West Valley nuclear site leaks into the creeks that flow into the Great Lakes and the water supply for millions a century from now, the cost would be triple that of cleaning it up now. The site is owned by the New York State Energy and Research Development Authority. In 1980, the private company that operated the site left it, leaving a cleanup estimated in the 1996 Draft Environmental Impact Statement by US Department of Energy (DOE) to cost over $8 billion (for complete cleanup). Also in 1980, the West Valley Demonstration Project Act passed Congress, directing DOE to solidify the liquid reprocessing waste and to cleanup a large portion of the site. Much excellent work has been done, but much is left to be done. Long lasting radioactive wastes from the solidification remain at the site. The ONLY way full cleanup will be achieved is through education and vigilance of the public and a clear demand. This is needed to prevent possible future nuclear activities at the site as well. They are working in conjunction with dozens of other local, state, national, tribal and international groups for the full cleanup of the West Valley nuclear and hazardous waste site south of Buffalo, NY and upstream of Lakes Erie and Ontario and of the Niagara River. Dozens of groups and individuals are part of the West Valley Action Network. There are many state and federal “regulatory” agencies with authority over aspects of the site. The site is owned by the New York State Energy Research and Development Authority [NYSERDA]. The NYS Departments of Environmental Conservation [DEC] and Health [DOH] have responsibilities. The US Department of Energy [DOE] was tasked under the 1980 West Valley Demonstration Project Act to clean up the reprocessing mess at the site. The US Nuclear Regulatory Commission has an advisory role and DOE is answerable to the US Environmental Protection Agency. This was summarized in a report by the Government Accounting Office in 2001. DOE and NYSERDA split the 1996 Draft Environmental Impact Statement (DEIS) on cleanup of the West Valley site into two separate Environmental Impact Statements (EISs). The draft of the second EIS was out for public comment in 2007 the decision in 2010 was to have PHASED DECISION MAKING AT WEST VALLEY. During Phase 1, from 2010 to approximately 2020, the Record of Decision stated, DOE and NYSERDA were to carry out clean up operations that they agreed are necessary and they would hire experts to help study, for 10 years, issues upon which they disagree such as the exhumation of the high level radioactive waste tanks, laden with high level sludge from reprocessing. Phase 1 provided an approximately 10 year delay for additional information to be gathered to make important final decisions by ~2020. In preparation for the 2010 EIS public comment period, an independent Full Cost Accounting Study, funded by the NYS Senate, was carried out to evaluate the long-term economic consequences of the various options for final disposition of the site. This precedent-setting, important study was designed to help inform potentially irreversible decisions on final site disposition that will impact the whole bioregion– local and downstream/downwind communities, the State of NY, Seneca Nation and Canada, Great Lakes and St Lawrence Seaway, etc– for generations to come. The study concluded that is cheaper and safer to exhume the waste at West Valley sooner rather than later, when, if even a hundredth of the radioactivity were to leak out into the WNY drinking water supply, would triple the cleanup costs. Groups around the country and internationally have joined the call for full cleanup of the West Valley, NY nuclear waste site. [Dig it up Resolution; Great Lakes United Resolution on West Valley; Group Statement – the Real Issue About Nuclear Waste]. You can join the effort as an individual, organization, or other by becoming part of the West Valley Action Network. In Feb 21, 2018 the DOE and NYSERDA published notice of the Supplemental Environmental Impact Statement on West Valley announcing public hearings and a comment deadline of 60 days. Western New Yorkers, members of the Seneca Nation and Canadian neighbors are mobilizing, once again demanding FULL CLEANUP of the entire West Valley Nuclear Waste Site. WIR Waste Incidental to Reprocessing: Like at other sites in the US (Hanford WA, Savannah River SC, INL ID) where irradiated nuclear fuel was reprocessed, the Department of Energy would like to declassify the high level radioactive waste that resulted. High level nuclear waste is required by law to be disposed of in a Nuclear Regulatory Commission (NRC)-licensed, deep geological repository that meets Environmental Protection Agency standards. DOE’s goal is to avoid those requirements by pretending the waste is not high level…working to declassify it so it can remain in place, threatening the water supplies downstream at all such locations. There is a national campaign against declassifying high level reprocessing waste to WIR—Waste Incidental to Reprocessing but DOE is intent on proceeding. So You Don't Want Nuclear Waste in Your Drinking Water? Diane D'Arrigo, Radioactive Waste Project Director at the Nuclear Information Resource Service, speaks about West Valley Demonstration Project at the Burchfield Penney Arts Center on March 1, 2018. Diane is introduced by Lynda Schneekloth of the Sierra Club Niagara Group. The Real Costs of Cleaning Up Nuclear Waste: A Full Cost Accounting of Cleanup Options for the West Valley Nuclear Waste; a new report conducted for the Center for Health, Environment & Justice, Nuclear Information & Resource Service, Citizens’ Environmental Coalition and the Coalition on west Valley Nuclear Wastes by Synapse Energy Economics. Letter from clean energy groups to DOE and NYSERDA on Probabilistic Performance Assessment that is now part of the plan for West Valley, with recommendations to ensure promised transparency provisions are met. The PPA will be used to prepare a Supplemental Environmental Impact Statement (SEIS) to be carried out by 2020. West Valley is highly erosion-prone and climate change is making it worse. In 2009 there was a huge flood that eroded nearby streams closer to the buried waste. Here are comments submitted in March 2013 on this danger. For over 2 years DOE and NYSERDA have failed to discuss and consider public suggestions made for studies to be done at West Valley. In August 2013, groups will meet with DOE and NYSERDA to discuss these and the failure to truly incorporate dangers of climate change into ongoing studies and planning. Multiple shipments of High level liquid nuclear waste (highly enriched uranium liquid) could come through WNY in the next year! Ask Gov Cuomo to STOP it. Would be from Chalk River nuclear complex in Ontario to Savannah River nuclear complex in South Carolina. “Cleanup Crew” Calls for State to Protect Lake Erie and Support Full Cleanup of West Valley Site. Press Advisory. Public Comment Deadline on West Valley cleanup has been extended until September 8, 2009. Key Points on West Valley Nuclear Site Cleanup Plan. A Summary Critique of the Draft Environmental Impact Statement. Groups throughout NY testified at the 4 public DEIS hearings on West Valley cleanup calling for Full Cleanup of the nuclear and hazardous waste site upstream of Lakes Erie and Ontario the week of March 30- April 2, 2009. NIRS Press Release.